The Season 3 midseason finale of The Walking Dead was an exciting, well-crafted, and tension filled hour of programming. The much anticipated fan favorite character Tyreese, who happens to be African-American, was finally introduced...with trusty hammer in hand. Rick and his party assaulted Woodbury in order to free Glenn and Maggie. The Governor's house of horrors was finally revealed to his lover Andrea. Michonne would seem to get a little bit of revenge--as compared to the full castration and various other amputations she suffered upon the Governor in The Walking Dead comic book--for his sentencing her to death several episodes prior. The first obligation of popular culture is to entertain. By this measure, I would suggest that Made to Suffer was a splendid success. However, while we may choose to acknowledge how the politics of pleasure are not always neat, progressive, redeeming, or "positive," this does not mean that a given work of popular culture ought to be spared difficult questions about the ideological work it is doing, or the values which it represents and reinforces. As I have written about on several occasions, The Walking Dead TV series is extremely problematic in terms of how it has negotiated the politics of race and representation. The show is also offering up a very conservative view of gender relations where The Walking Dead is ultimately an exercise in reinforcing how white masculine authority is natural, normal, and in the Age of Obama and the Great Recession, in many ways imperiled. While The Walking Dead is set in a post-apocalyptic fictionalized present where zombies walk the Earth, like all popular culture, it is actually a mirror for our current social anxieties. The Walking Dead TV series is also part of a long Hollywood tradition in which black people have been depicted according to standard tropes where they are racially stereotyped and depicted as "magical negroes," subservient maids, butlers, and house servants; as confidantes for white characters; or as hyper-sexual and/or violent brutes. As we have seen in The Walking Dead to date, black characters are also subjected to being made either invisible and mute (T-Dog) or omnipresent because of their "blackness" (Michonne as the magical negress zombie killing machine). In "reading" The Walking Dead TV series (or any other type of popular culture text) it is important to keep in mind a few foundational concepts. Film and TV teach the audience how to watch it by working within certain storytelling rules and assumptions. As an example of the zombie genre, the audience of The Walking Dead knows to expect horror elements, social commentary, and a running reference to George Romero's foundational idea that when the undead walk the Earth, it is the living who are the true monsters. Popular culture contains various cues or "codes" that viewers of a film or TV series may not be consciously aware of. Likewise, the creators of a given type of popular culture have (usually) also internalized the same values, ideas, and sets of societal assumptions as their audience. Consequently, in terms of how race, gender, sexuality, and other socially significant identities are represented, these concepts may be doing social and political work in ways that range from the obvious to the subtle and implied. Popular culture communicates meaning to the viewer; however, not all viewers buy into its themes in the same way. In the United States, popular culture has historically been dominated by the White Gaze. As a result, people of color are marginalized, and the particular (and peculiar) racial logic which locates white folks as both the universal and unstated audience, as well as subject of mass entertainment, is taken as the norm. Considering that upwards of 95 percent of the creative and executive positions in Hollywood are filled by white men, this type of racial myopia should not come as a surprise. For those of us who are written out of popular culture, and/or are represented in demeaning and stereotypical ways, we often have to read ourselves back into a given cultural text. Oftentimes, this involves challenging how a film or TV show, and its majority white audience, takes meaning from it. The Walking Dead presents many opportunities for what are termed "oppositional" or "critical" interpretations. 1. First and foremost, I am a fan of The Walking Dead graphic novel and the universe Kirkman has created there. The TV series is its own self-contained world, one which Kirkman is very comfortable with and has fully endorsed. What characters or storyline from the comic would you like to see introduced? Abraham? The Hunters? What to do about Morgan or Rosita? 2. There were several visually and symbolically potent moments in Made to Suffer. Hierarchies of race and gender have done a great amount of social and political work in the United States. In particular, the ways in which black women's bodies have been subject to violence and discrimination, because of the twin inequalities of gender and race, were (and remain) potent sites of Power and contestation. As such, given the history of sexualized violence by white men against African American women, the visual of an armed black woman confronting a white man is explosive in its meaning and historical gravity. This leads to a few questions about Michonne's interactions with Rick and the Governor. 3. Michonne avenges her "violation" by the Governor in a brutal fight where she pokes out his eye with a piece of glass--literally and symbolically penetrating him. Michonne also kills his progeny and "seed." In total, she defies white male authority by fighting desperately and winning a victory. However, her friend Andrea, a white woman who Michonne played caretaker, best black friend and nurse to--in keeping with the tropes governing black women in popular film and TV--quickly defaults to a state of loyalty to her white male lover. Here, Andrea, a white female character who is yearning for more responsibility from her white male partner (and main authority figure in their community) chooses to side with the Governor, a racial ally, instead of Michonne, a black woman who has been far more loyal and kind to her. This scene is evocative of some of the heated disputes between white feminists and womanists regarding the role of race (and racial in-group affinity), in thinking about gender inequality. As in the "real world," it would seem that "every sister ain't a sister" in The Walking Dead. 4. Michonne is later confronted by Rick, the white male protagonist of the show. This interaction is also problematic as it surrenders the black female strength of Michonne to the dominant white male authority of Rick. Consider the following. Michonne has led his group to Woodbury in order to save Maggie and Glenn. She has also brought them baby formula and other much needed supplies in a previous episode. There, she is interrogated harshly and physically tortured by Rick and his group in order to test the veracity of her claims upon arriving at the prison. Michonne, then aids them in their assault on Woodbury. During the raid, Rick casually disregards her presence and shows no concern for "that woman" to Glenn and Maggie. Michonne, then appears at the end of the episode to offer information and assistance. Rick again threatens Michonne, pointing a weapon at her, and accuses her of leading them into a trap (of which, there is little to no evidence for such a motivation). Michonne is forever suspect despite her loyalty to the white characters. She is a magical negress huntress zombie killing machine; but, as seen in the eyes of White Male Authority, Michonne, as a black woman, is forever a threat, violent, untrustworthy, and suspicious. What follows both deviates from the character in the comic book, as well as what has been established by the TV series. She pleads to be included in a group of people who clearly do not want her around. Michonne is supposed to be self-reliant and the stereotypical "strong black woman." But, Michonne is willing to betray all of these traits in order to find acceptance (and approval) among the white characters with their simultaneous distrust and suspicion of her. Symbolically, Michonne exists in the odd, liminal, and paradoxical space that blackness often occupies in the West. Black folks are loved and hated, envied and cursed, exist as citizens and anti-citizens, and are simultaneously visible and invisible. Will Michonne be all of those things in The Walking Dead? In addition, I get a sense that the writers of the show do not really have any affinity or love for Michonne's personhood. There is something mean and cruel about how she is being treated by Rick and his party. Am I alone in picking up on this energy? Are they contemptuous of her? Do they hate Michonne for some reason? 5. Tyreese, is ostensibly a corrective for the previous black male characters on The Walking Dead TV show who have been marginalized, muted, and peripheral. "T-Dog" was a black gollum chauffeur manservant who had very few lines, and was a clear example of how the show's writers have no interest in developing African-American characters. The other black male characters introduced in this season were quickly killed. In Made to Suffer, Oscar, one of the now free inmates working with Rick's group, was predictably dispatched during the rescue mission at Woodbury. In service to the centrality of white male authority, it would seem that The Walking Dead TV show has a formal rule where no more than one black man is allowed to be a central (or even peripheral) character on the show at a given time. 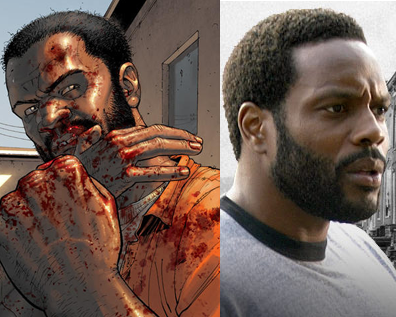 In the comic book, Tyreese is a central character who rivals Rick's authority and charisma. Tyreese even takes over leadership of the group when Rick has a breakdown. It remains to be seen if Tyreese will fall into the stereotype of best black friend and loyal aid to the white main character, Rick, or if he will evolve into something else. Made to Suffer offers some troubling signals in this regard. Because the show is centered upon white masculinity and its imperiled status, it is important to note how said concept has functioned in the United States over time. Race was formed in the crucible of slavery and colonization. This system created a social hierarchy with white men on the top, followed by white women, and then black men and black women on the very bottom. The latter two categories of people were uniquely marked as human property. While white women were under the legal control of their fathers (and then husbands) they still had more authority than black women (and especially black men) who were considered the "public" property of all white men, to be used and abused as the latter saw fit. Unlike white women, black women could not make any appeal to their black "husbands" for protection against white violence and exploitation in the public or private spheres. Historically, White authority also extended to children. Ultimately, White children had more power and authority than even black adults (and in many cases even "owned" adult slaves). The Walking Dead TV show mirrors this relationship. In Rick's absence, his son, a thirteen year old, has authority over the group. Carl is a stand-in for his father. Tyreese and his party seek shelter in the prison. Carl is naturally suspicious of these new arrivals. After helping them fight off a group of zombies, Carl imprisons Tyreese and his group of new arrivals in a prison cell. Whatever the contextual logic, Carl, a white male child, has more authority than Tyreese, who is a black man. In response, Tyreese defaults to the "reasonable" black adult and tells his group to not resist. Carl, armed with a gun, and most importantly, his father's authority, is now in charge of Tyreese and his group of travelers. Given how race and gender have been coded for in the show, this inversion of "natural authority" is made all the more reasonable, natural, and sensible. Interactions such as Carl's towards Tyreese do potent work on a symbolic level by normalizing White Authority...even that of white children over people of color. I gave up on the show a year ago because of its rampant misogyny and occasional stupidity. I'll leave it to sharper minds to figure out whether or how this merges into the racial aspect of the discussion but why do the writers continually make Michonne engage in self-sabotage by witholding information from allies? Earlier in Woodbury she only tells Andrea that they should go, witholding her suspicions about the natl guard ambush and other shady things she's seen. Later, at the prison, she doesn't tell Rick's group about Andrea. Or Merle. She knows the relationships and history. Then she leaves without a word to go after the Gov during the attack on Woodbury and returns again, without explanation, afterwards. The character was never this awful in the comic. I have a hard time putting all or even most of this on Kirkman because his solo efforts are in such contrast to what emerges when he's in a room full of TV writers. He may be comfortable with and endorse the TV universe but the contrast between the two begs an explanation. @anon. I love the comic. One of my prize possessions is the first trade signed by Max Brooks where he crosses out Kirkman's name and writes down some not so nice things. If anyone wants to bid on said item email me :) I am always up for offers. Michonne is a hot mess. I am not kidding when I write this, Michonne has been made into a tamed savage who doesn't really speak but who is desperate for "white civilization." The writers have some real issues with black characters. One of the directors is actually african american too. This is a cultural problem in hollywood and our society more generally. Notice how the reviewers of the show even make note of the 1 black guy Highlander rule and then disregard such matters as unimportant. Talk about white (male) privilege. Yo, son! Brothers are just zombie fodder on this show and T.Dog was Shakespeare compared to the brother who got offed yesterday. And both of them brought it trying to save "da white women" Note to all you Emmet Tills out there. You can sacrifice your life for them but sticking your arm in a zombie's rotten mouth, but just don't whistle, wink or fail to move off the sidewalk when you see them coming! Sorry, but my appetite for zombie and vampire entertainment was overfilled before this show premiered and I've watched none of it. Hence, it seems, I'm safe from this particular show's failure to live up to CDB's standards. Wondering about your analysis of BOARDWALK EMPIRE, which I do watch and which has the ever-fascinating Michael K. Williams as Chalky White (many will remember him from his portrayal of Omar Little on THE WIRE), along with quite a few "supporting" actors of color. The tension in the last episode (and in many other episodes) between Chalky's gang and both of the Italian gangs in the Atlantic City wars (Capone and his bunch from Chicago, & Gyp's NYC-based mob) was palpable, though finally resolved by the ambush in the woods. A nice moment between Chalky and Capone, not quite as perfect as Capone's line at the end of the penultimate episode, but pretty damned good. I found a 2010 article about the historical figure upon whom Buscemi's character was based (and his first and nickname really were "Enoch" and "Nucky"). Wondering if there was a historical Chalky. Seems like a great deal of the events are grounded in reality. I'm not sure if that can be said of the WALKING DEAD: I'm really out of the Zombie Apocalypse loop these days. @MG. I love Boardwalk Empire. The whole show is a very smart exploration of white racial formation and how white ethnic identity was made in the U.S. post ww1. They need some references to the Bloody Summer race riots of the same moment...they have made some but I am a few episodes behind. Not sure where author gets her, 95%Hollywood executives are male nonsense. The Hollywood exec. is a woman. Then gay men. Programming is overwhelmingly female oriented, female driven, or on a dedicated female network. Many pitches in this town get ditched for being "too male driven." @Anon. do choose a name. Check out the citations in the book Screen Saviors. Don't make an error in reasoning, you can still have a male dominated business that turns down projects for reasons of profitability.